Once again, it's time for another interview segment on the Rare Rockin' Records blog. Some may know him as a producer, arranger, and engineer for such artists as Neil Diamond, Johnny Mathis, and Elton John. 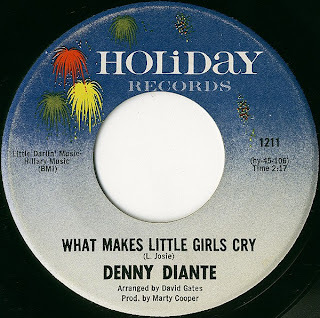 Here at RRR we love Denny for the teen records he made in the 60s. 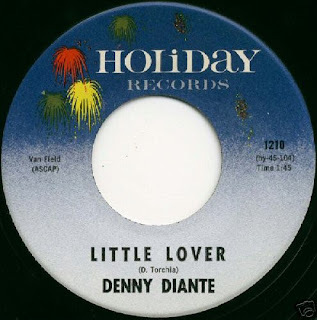 I hope you enjoy learning the backstories behind the great tunes Denny sang and recorded back in those glorious days. Kyler:What were the circumstances behind your signing with Holiday Records? DENNY:I was introduced to Cal Van Zile by a friend. Van and Harry Fields were just starting Holiday Records. He brought aboard Marty Cooper to run the label as well as produce. Marty was known for working with Jack Nietzsche and Lee Hazelwood. Jan Davis (the Fugitive), Marty (the Shacklefords) and yours truly were the first 3 artists signed to the label..actually I was the first. Kyler:You had two singles with Holiday, I’m going to list each title and then maybe you could give me some thoughts/memories about them? The first one is “Little Lover”. Kyler:Your vocal on Little Lover seems reminiscent of Dion. How big of an influence was he on your style of singing? Kyler:Next up is “Faraway Places”. DENNY:Marty Cooper choice and production..great David Gates arrangement…terrific record…I thought it was too adult for me at the time…I wanted to sing to girls and fun in the sun stuff. Kyler:The next one was “What Makes Little Girls Cry”. Kyler:The B-Side of that was a great ballad entitled “Traveled”. DENNY:I wrote “Traveled” when I was still a teenager…can you tell. My original demo was pretty close to the record but Gates (pre-Bread) put his great touch to it. I wanted strings and all the backing stuff but the record was finished before I could get my shots in…most likely a money thing for a small label. I get emails from all over the world asking about this song….only took a few decades and the internet for a little recognition.. I had a few fan clubs starting in Europe and Asia but Holiday was not to be around long enough to be successful. Did a bunch of teen mags with photos and stories, just didn’t have the financial backing to go all the way. Traveled was a favorite of Arthur Lee and Love who played it in the Jukebox at BiDoLiDo’s every night..a club in a Hollywood alley….who knew? Kyler:Were there any unreleased/unissued sides done while you were at Holiday? DENNY:We did a few more sides but Holiday closed up so I signed with 20h Century Fox Records. 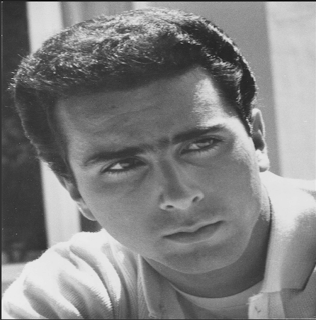 Bob Marcucci who managed Avalon and Fabian, thought I had the talent and look to become successful. He started me in acting classes and put out the first single “Just a Boy In Love” Marty Cooper and Ray Whitley wrote the song and Marty wanted me to do the “Billy Joe Royal” southern sound..so I did. AT the same time, the co-publisher of the song got 2 other cover records to come out at the same time so the competition killed all 3. I got the most action but by then I was more interested in making records than performing…I started hanging out at Gold Star studios in Hollywood where, Stan Ross, Dave Gold and Doc Siegel started teaching me how to engineer and mix. Singing took a back seat. I then went to work with Marty and Vicki Cooper at their publishing company learning all about songs and song plugging (I hate that term) Did a bunch of demos and learned how to make records. Kyler:Finally, Denny, please tell our readers what you are up to these days. DENNY:Still producing records..mainly in Nashville…doing an occasional movie….producing special market productions….may teach a master class at NYU….do the Taxi.com conference every year as part of the final night A&R listening sessions… chops are still up….loving the rediscovery of the 60’s records….life is still rock and roll to me!!! I would like to thank Denny for taking the time to answer the questions! I hope you've enjoyed this latest interview segment. Please check out the Rare Rockin' Records shop and learn about past, new, and upcoming releases (new ones by Billy Meshel and Paul Petersen coming soon! ).